Aqua terra "jasper", also known as "impression stone", is the trade name for soft onyx marble. 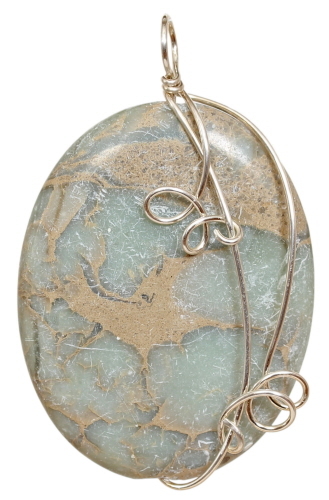 This bead is grey/green in color and streaked with creamy beige, cut into an oval shape and measures 44 mm x 35 mm. Wrapped in argentium sterling silver wire. Finished size is 56 mm x 35 mm. Weight is 0.7 oz.